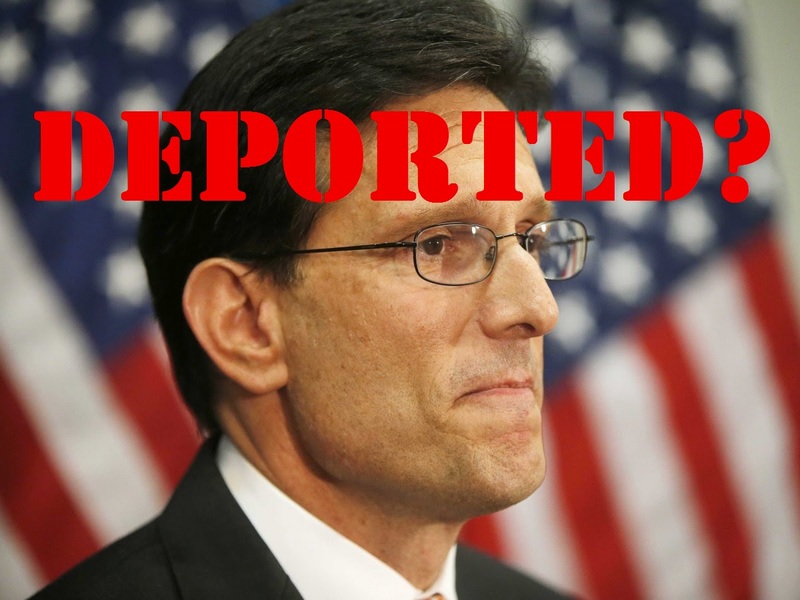 Eric Cantor’s recent slap down was about immigration, but not in the way that some think. Voters want leaders who talk straight and fix the problems that hold us back as Americans. Instead, Cantor chose to pander on immigration, telling some that he wanted to be a part of the solution, telling others that he was single-handedly forestalling amnesty, a “solution” that no one at the time was actually proposing. Elections in two states similar to Virginia provide evidence that voters will elect conservative Republicans who lead on immigration reform. Lindsey Graham’s landslide victory serves as a case in point. Graham “ran on immigration while Cantor ran away from it.” Graham finished forty-five percentage points ahead of his nearest competitor, after establishing himself as one of the leading Republicans trying push immigration reform this summer. Representative Renee Ellmers of North Carolina, who recently squared off with talk show host Laura Ingraham, is another example of a Republican candidate who won handily after taking a very strong and consistent position in favor of immigration reform. Her opponent, Frank Roche, was unrelenting in his criticism of Ellmer’s support for immigration reform, making it the central issue in his campaign. Like many in the anti-immigration camp, he consistently misrepresented her support for a long and difficult earned pathway to citizenship as “amnesty.” Roche’s hopes for victory were bolstered by strong endorsements from Laura Ingraham and Ann Coulter. Coulter claimed that Roche was more knowledgeable “about immigration than any sitting member of Congress,” and that he was “the candidate that true patriots should support with everything they have.” Instead of pandering to those who misrepresented her support for a common-sense, pro-growth approach to immigration reform, Ellmers stood by her principles, refused to back down to critics like Ingraham and Coulter, and won by almost twenty percentage points. Ellmers won because she because she understood that a reasonable approach to immigration would appeal to conservative voters, a fact confirmed by recent polling which showed that even among the Tea Party, two of three voters weren’t buying the ruse about amnesty. They supported a pathway to citizenship for those willing to earn it. Those who rant about so-called “amnesty” fail to inform voters that the policy under consideration is actually a decade-long process filled with fines, criminal background checks, English requirements, prohibitions on access to welfare, work requirements, and a stipulation that those “in line” legally must be processed first. I’m writing this article while in Pittsburgh attending the second annual conference for Global Great Lakes, an organization devoted to harnessing the potential of immigration to reinvigorate cities and communities across the Midwest. Failed candidates like Cantor and Roche would do well to take note of the communities represented at this conference. The optimism of the city leaders represented at this conference about America’s future is a stark contrast to the apocalyptic vision of those like Coulter and Ingraham whose entire approach to immigration seems to be driven by fear and latent nativism. Cities like Pittsburgh, Detroit, St. Louis, and Cleveland realize they need an influx of new people and new talent to reverse the crippling loss of jobs and population. Detroit has announced a goal of attracting 50,000 immigrants in the next five years. St. Louis has a plan to develop the fastest growing immigrant population in America by 2020. Michigan’s Republican governor has created a state level Office for New Americans, and Pennsylvania has just announced its intention to do the same. Meanwhile, here in Ohio nine of our top ten metropolitan areas are rapidly shrinking. Springfield recently had the dubious distinction of being named one of America’s ten fastest shrinking cities. Youngstown, Mansfield, Steubenville, Dayton, and Cleveland have shown up on other lists of communities threatened by declining population. Collectively, Ohio’s ten largest metropolitan areas have lost 137,000 people since 2000. That is equal to eliminating Clark County, the county where I live. States and cities are recognizing the economic potential of immigration. Dayton has received national accolades for its proactive approach to immigration-based economic development. Columbus, Cleveland, Toledo, Cincinnati, and Springfield are all at different stages in launching immigrant-friendly economic development plans. A consistent theme among those at the conference is that it is time for those in Washington to listen to those in state and local government. To reverse population loss and grow our local economies we need common sense immigration reform, and we need it now. The U.S. Chamber of Commerce website features a video of Grover Norquist and other noted conservative business leaders making the conservative case for immigration reform. Their FreeEnterprise.com feature dispels many of the myths propagated by those seeking to prevent immigration reform, including canards about immigrants coming to commit crimes or abuse welfare, claims that that don’t stand up to the facts. Business leaders also understand the need for more high-skilled workers to develop new technologies and create jobs. Here in Ohio, technology leaders like Pat Valente of TiE Ohio recognize the relationship between immigration and entrepreneurship. said Valente. According to the National Association of Foreign Student Advisors, Ohio’s 24,000 international students pump nearly $720 million into the state’s economy each year, and although they account for only 6-7% of student population, they account for 49% of our STEM graduates. Instead of sending these graduates back to their country of origin, as often dictated by current immigration policy, we need to find creative ways to keep this talent pool in Ohio. We need immigration reform at the federal level to make this happen. Conservative faith leaders, a group that has been critical to the Republican Party since the 1970s, also favor reform. Recent polls show that two-thirds of white evangelicals support reform that includes a path to citizenship or legal status. While support among white evangelicals has shifted somewhat from citizenship to legal status, nearly 50% still favor a path to earned citizenship for those who qualify. The Evangelical Immigration Table (EIT) has recently released a documentary called The Stranger that highlights a biblical and economic case for reform. The EIT has sponsored over a thousand screening for the film, including screenings in Cincinnati, Dayton, Springfield, and Columbus to encourage church members to allow scripture to shape their views on immigration … and to call Congress! This effort highlights their resolve to keep immigration reform on the front burner, asking Congress to follow the lead of people like Lindsey Graham and Renee Ellmers, and to pass reform this summer. A third voting block that Republicans can’t afford to ignore are Latinos. Much has already been said about the importance of this group to future elections. Between now and 2050, the Latino portion of our population will grow by 86 million, reaching 128 million, or 30% of our population. According to Pew Research, by 2030 the Latino vote will double in significance, with Latinos accounting for 40% of the increase in eligible voters between now and then. Anyone who is expecting people like David Brat, Ted Cruz, and Jeff Sessions to turn these future voters into loyal Republicans has had at least one too many margaritas. But writing them off as future Democrats is also an unnecessary mistake. Latino voters tend to care about social values that give Republicans an opportunity to win support. Faith, family, and education are key issues that Latino’s care about, and Republicans need to address these issues with a compelling vision of hope. Historically, when Republican presidential candidates win at least 30% of the Latino vote, they end up residing at 1600 Pennsylvania Ave. As their portion of the overall population increases, that benchmark will edge up as well. Recent polls show that 50% of Latino voters blame Republicans for the broken immigration system, compared to 11% who put the blame with Democrats. Hispanics report that they like Republican ideas on taxes, support for small businesses, and school reform, but they are driven away from the party by the current anti-immigrant rhetoric voiced by the far right. The good news is that 76% said they would reconsider their opposition to the Republican Party if Republicans would actively support immigration reform. And finally, much has been said about Tea Party opposition to immigration reform. A recent survey or Tea Party votes suggests that far-right media pundits are misreading (and misleading!) this group. Seventy-one percent of self-identified Tea Party voters want Congress to act on immigration reform this year. Seventy-six percent support a plan that addresses border security and interior enforcement, and includes a way for undocumented immigrants to achieve legal status if they pay penalties, pay back taxes, pass a criminal background check, and learn English and American civics. Seventy percent would even grant them citizenship. Lower levels of Tea Party voters would support a plan that addresses border security and enforcement alone. Cantor’s loss resulted from a wide array of issues. It almost certainly wasn’t caused by his support for immigration, which at best was paltry and inconsistent. If anything, it is evidence voters want to elect people who listen to them. From across the voting spectrum, Americans recognize that immigration is broken, that fixing it will improve our economy, and that ignoring it violates many of our most important values. It’s time for Republicans in Congress to show that they have listened and to demonstrate the moral courage and hopeful vision to pass reform. Carl Ruby is a consultant focused on Republican advocacy for immigration reform. He is currently founding a new nonprofit organization focused on the economic empowerment of Ohio’s first generation Americans and a research consortium devoted to the study of factors related to the upward mobility of immigrants. Visit carlruby.com to see how he is networking among evangelical leaders and members of Congress to reform immigration.